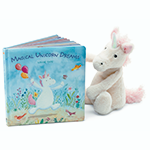 'Magical Unicorn Dreams' book along with Bashful Unicorn plushie is a fantastic set to give as a gift to any infant, child or anyone young at heart. "When tucked in bed and drifting to sleep, this is when nothing is quite as it seems. There's a magical land only children can see, where Unicorn joins in their dreams." Flying, diving, discovering treasure - all thanks to a sparkling unicorn. Little readers will love this adventure, and next time they snooze, they can go along too! Open the cover to Magical Unicorn Dreams and discover a truly magical world. Bashful Unicorn plushie is full of magic and moonlight. So very cuddly, with squish-squashy hooves, even her horn is shimmery-soft. Sprinkle bedtime with stardust and let imaginations gallop! Sugar-sweet in pink and white, Bashful Unicorn is such a delight.